Everything you love about the web, now on a phone. Introducing the new Mobile with Google. 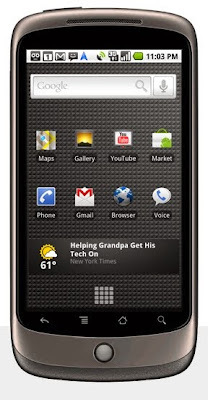 The device is manufactured by Taiwan's HTC Corporation, and became available on January 5, 2010. Features of the phone include 3.7-inch AMOLED touchscreen, 5-megapixel camera, Wi-Fi connectivity, accelerometer and compass, the ability to transcribe voice to text, noise canceling dual microphones, and voice directions while driving. The phone is sold via Google's website google.com/phone, at a price of $529 unlocked, or a subsidized $179 when purchased with a T-Mobile two year contract. This is not yet available in the Philippines.